Batteries can go bad but that is no a reason to buy a new battery pack! Our 18v battery replacement pack that has been built with the tough construction worker in mind. The batteries in our pack rebuilds are made to withstand shock and vibration from use (not held together by contact paper alone). We use 8 welds per battery to guarantee excellent conductivity of current - which is often 6 more welds than the factory! Our battery pack rebuilds are built to last! NOT IN KENTUCKY? NO PROBLEM! 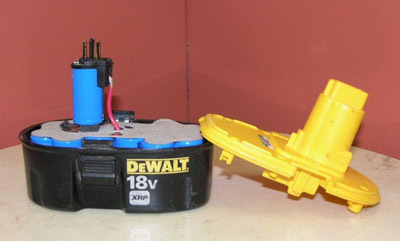 If you have a DeWalt rechargable battery, we can ship you the batteries assembled, and you simply drop in the pack! If you have a different voltage or brand you can e-mail us and we will build a replacement pack for your battery pack, according the price list to the right (plus shipping). You can also send us your battery or battery pack and we will rebuild it and send it back to you ready to go (it cost less to ship without the old batteries inside). We can even get into those tough to open Makita's and other sealed battery packs.